Picking Bolt Thrower classics from their discography is a difficult task indeed. I was once of those ignorant few that hated the band for their apparent dullness, for their knack of making albums that sounded the same and had little for an eager young Metalhead to get his teeth into, and my moment of realisation had as much personal relevance as must have Joan Of Arc or Saul on the road to Damascus. The album that caused this revelation? None other than Bolt Thrower’s fourth opus, the well-titled IVth Crusade, referring of course to the bloody and treacherous fourth crusade, much about which has been written by far wiser heads than mine. Whatever the history, the inspiration was clear, and this ignoble period of time has proven fertile ground for Bolt Thrower’s gleaning – this album simply kills. Partway through their discography, The IVth Crusade is often ignored due to its position between two generally acknowledged classics, Warmaster and ...For Victory, yet it’s at least as good as the latter, if not the former. The pulverising likes of Icon and Embers are the heaviest that the band has ever been, piledriving slabs of brutality that batter the listener down and force him to give his all – beyond all doubt, this is Death Metal at its most primordial, the essence of the genre melted down and cast into .50 calibre rounds that will split any man in half. Andy Whale’s simplistic yet essential battery, the ever-present Jo Bench, Gavin Ward and Barry Thompson on bass and guitars respectively, the former the most overlooked female member of an Extreme Metal band in history, the latter a guitar duo unrivalled in persistence and blunt brutality by any... not to forget, of course, the mighty Karl Willetts on vocals, his harsh growl provoking violence like few others can – this is a squadron fit to face any fight. 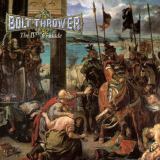 If you know anything about Death Metal, you know that Bolt Thrower’s primary concern is war, and few of their albums capture that head-down drive like The IVth Crusade does. Each and every track here is a sledgehammer to the skull that enters your brain and never leaves, despite being barely different from each other. Any example from the album will do: This Time It’s War the song title screams, and the ominous build-up until Willetts snarls those words in outraged fury is as gripping as anything any epic Metal band ever created. Don’t expect to love this album from the start, nor expect it to fit in perfectly alongside your Cynic albums. Bolt Thrower are not a band that you pick up and love, they are a band that you listen to, shrug your shoulders, and then shelve, until comes such a time as your life needs a slab of warfare and you listen, fists clenched and mouth twisted in a snarl of rage. The IVth Crusade is not the sort of album that you take along on a honeymoon, it’s the album that you listen to before heading up out of the trenches and into enemy fire, fighting killing screaming your opposition to all. Any catchiness that you pick up is not the result of deliberate poppy hooks, it’s your brain slotting into its ancient pre-civilisation groove, man as killing machine and nothing more, nothing less. This album is the perfect antidote if you’re too poisoned by the Progressive, too in thrall to the foreign elements that made Death Metal a weaker being after its early heyday. We can all agree that musical extremism has not been as relevant an element in Metal as it once was for a good few years now, and whilst a whole flurry of subgenres have been born, sometimes it’s good to get back to the primitive and remember exactly what those early Death Metal bands were rebelling against. Bolt Thrower never sold out, never watered down their sound, and The IVth Crusade is just one expression of their eternal war on mediocrity – it’s absolutely vital to any Death Metalhead, and should be experienced at least once by those weaklings who dare not sign up for eternal warfare, to show their feeble skulls what true passion and rigid adherence to values sounds like. Wherever you place this amongst the Bolt Thrower pantheon, it belongs there.